Welcome to eclectic Paperie’s Get Altered Challenge! The Get Altered Challenge is held on the first Thursday of each month and each challenge is an opportunity for you to be inspired by one of our eTeam’s creations. This week it’s Donna-Marie here to share the new challenge, alter a glass bottle or jar. I started with a bottle I got from Michaels for $3.99. I painted the top section with Viva Decors Maya Gold Paint. 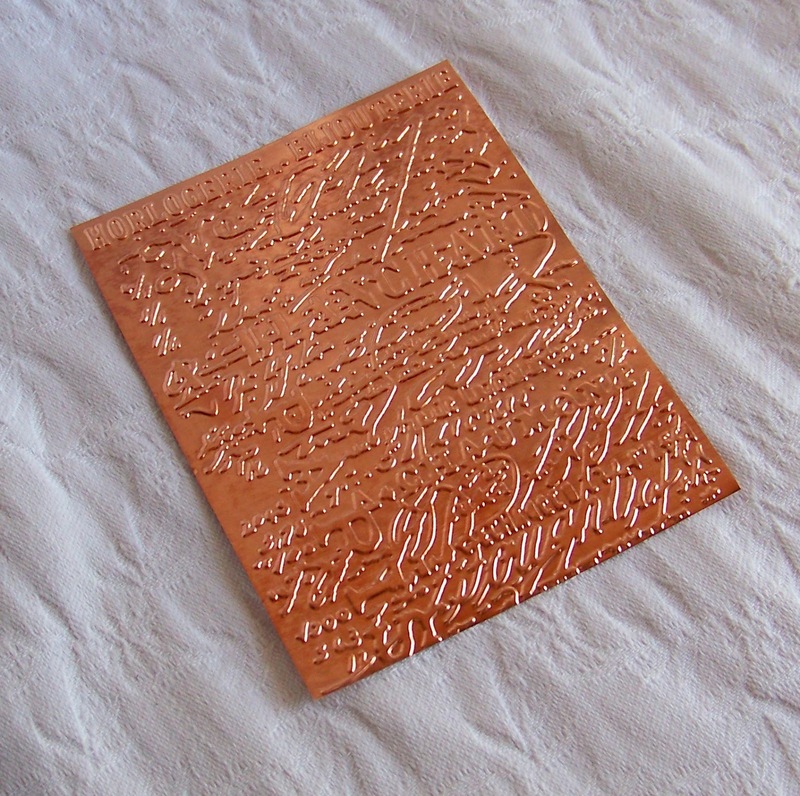 I then embossed a piece of copper metal with the new Tim Holtz French Script Folder. I cut the piece in half and glued it to the bottom with glossy accents. It needed some extra pressure while it dried so I used elastic bands to hold it down. I then used 7 Gypsies Black Script Gaffer tape on the bottom. The black visually weights the bottle down...(the yellow and red lines are the elastic bands). 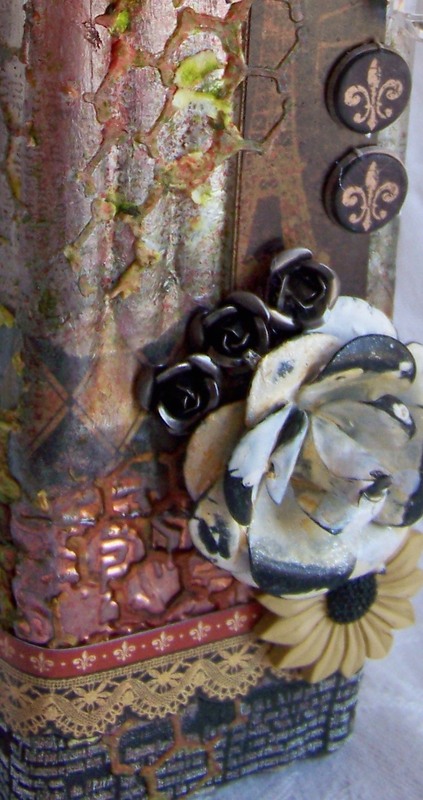 I then used Tim Holtz Tissue Script Paper. I tore it into little pieces and glued each one down with Matte Medium. I then added a strip of torn paper from the G45 French Country Line. Ok so now I have put the stopper in, added Black Soot ink all around, used Wendy Vecchi's Embossing Paste with The Crafter's Workshop Chicken Wire Stencil, added a sticker from the G45 French Country Line, and a Wendy Vecchi Crown. 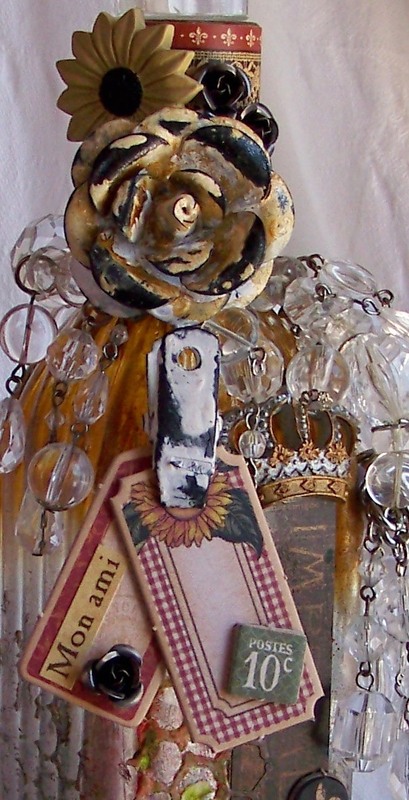 The metal flower is from Melissa Francis, small metal flowers are from Mommenta, The sunflower is from Wendy Vecchi, the beads are an old bracelet that fit perfectly around the bottle top, and G45 Tags and stickers from French Country. More metal flowers, stickers, sunflower, and elements fro G45. I hope you can come out to play along with us and alter your own bottle!! I can see these making great gifts you can fill them with seasoned vinegars, home made marinades, oils, bath salts, or drinks. The Get Altered Challenge is about exploring your creative journey, about stepping outside of your comfort zone, experimenting with new products, and creating altered and mixed media art. We want to see your work and hear about your inspiration! All of those who play along with our challenge will be entered into a prize drawing for a $15.00 gift certificate to the eclectic Paperie store. -You do not have to use products sold in the eP store…but we do love it when you do! -Share a direct link to your creation, not just your blog, using the Linky Tools feature at the end of this post. If, for any reason, the Linky Tools doesn’t cooperate, please add a link in the Comments section of the blog. -When uploading to any online galleries, please use any of the following keywords; eP, eclectic Paperie or Get Altered Challenge. Link your creations to the eP blog. -If you’d like to be considered as one of our featured projects and be entered into our prize drawing, please be sure to add your link no later than 6:00 pm EST on May 16th. The winner will be announced right before the eTeam Picks Challenge. THUNK! (the sound of me passing out at the sight of this beautiful bottle creation) This is AMAZING! I love all the details and bangles and, well, just everything about it. Awesome job. This is amazing, attention to detail and all the finishes make this just as stunning as can be. I'm with Annette.....holy cow, that is simply stunning. Oh my word, Donna-Marie, this is incredible. I love all of the finishes and gorgeous details. Just an amazing inspiration piece that I couldn't even imagine let alone make. Well done! This is totally stunning, Donna-Marie. So many gorgeous details... I love it! how gorgeous is this!!!!!! Amazing project, so many beautiful layers and textures - awesome! Donna-Marie it's amazing!! I can't believe you stashed all those goodies - I have nothing!! LOL! What a pretty little bottle to have - awesome job!! What an absolute showstopper!! Completely fabulous make, Donna-Marie, wow! I'll be along to play tomorrow (a much simpler affair altogether, I fear!). your bottle looks fabulous. Love all the details. Wow! What a work of art this is, Donna-Marie!! I hope I'll get to play along too! Oh my giddy aunt..you have sure done a beautiful job altering Donna Marie!!! Hope to play along this week too. WOW WOW WOW and thanks for the tut. I may try it myself...maybe. My jar came in handy for this challenge. Just had to have a go. Got in a right mess but loved the outcome. Love all the DT work on this challenge. Class Project with Dina Wakley! eP Picks Challenge - Gel Medium! Poppy Background Mixed Media Card!